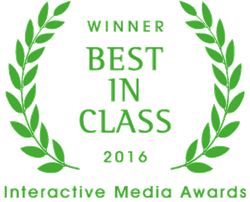 DL Media earned the Interactive Media Awards’ (IMA) Best in Class Award for their inkinktat.com responsive, mobile-ready website design, created for Ink Ink Tattoos & Piercings studios in Springfield and Branson, Mo. We crave new challenges. Our team had great fun developing an artists' showcase and team calling card for the talented gals at Ink Ink. I believe their clients will have just as much fun exploring the site as we had designing it. DL Media earned the Interactive Media Awards’ (IMA) Best in Class Award for their inkinktat.com responsive, mobile-ready website design, created for Ink Ink Tattoos & Piercings studios in Springfield and Branson, Mo. The website went through a comprehensive judging process, achieving very high marks in each of the judging criteria. IMA judges critique website entries in a points-based scoring system, with a maximum score of 500 points. The five criteria include design, content, feature functionality, usability and standards compliance, with a maximum score of 100 in each. DL Media received a score of 489 in the arts and culture category of the 2016 award year. DL Media designed inkinktat.com with the goal of showing the world ink isn't just a man's game. They endeavored to create a fabulous showcase for each artist's work while also introducing the individual artists on Ink Ink's team. The site features an interactive tattoo portfolio sortable by artist or tattoo type, social media integration, a monthly customer feature section, live chat capability and an online shop for selling Ink Ink gear. “We crave new challenges. Our team had great fun developing an artists' showcase and team calling card for the talented gals at Ink Ink. I believe their clients will have just as much fun exploring the site as we had designing it," says Dianne Davis, owner of DL Media. "It's icing on the cake when you receive an award as recognition for your hard work." “We love our new site. It's super user friendly and a hub for all of our social media platforms,” says Kelsey Rogers, owner of Ink Ink Tattoos & Piercings. "Not only does the site authentically represent the spirit of our shop, customers and crew, but it gives our clients an opportunity to choose a tattoo artist and style to suit them before they even arrive. It adds another level of comfort and warmth to their entire tattooing experience." The Interactive Media Council, Inc. (IMC), formerly known as Benjamin Services Group, Inc. (BSG), was originally created in 1998 as a loose collaboration of like-minded web professionals providing application development, creative services, e-business consulting and other marketing-related services to new and established businesses in the New York City area. In 2006, IMC launched the Interactive Media Awards as a method of providing accomplished and talented web professionals with the endorsements and tools necessary to be recognized in the national marketplace as leading providers of top-tier services. Established in 2013 by tattoo artist Kelsey Rogers, Ink Ink puts a new spin on the tattoo and piercing world. Ink Ink, Missouri’s only all-female tattoo studio, dares to show the world ink isn’t just a man’s game. Each licensed Ink Ink tattoo artist receives training from Rogers. Artists are then encouraged to develop their own style and flair. Ink Ink’s Springfield location is located on historic Commercial Street with a second location in Branson.